Mathangi "Maya" Arulpragasam (born on July 17, 1977) is a vocalist, songwriter, composer, record producer and visual artist of Sri Lankan Tamil origin. 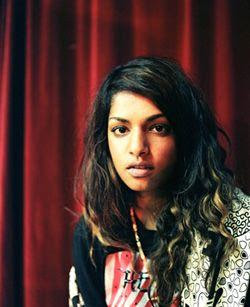 She is best known by her stage name, M.I.A.. Her music style contains elements of grime, hip-hop, ragga, dancehall, electro, and baile funk. In 2005, her first album, Arular, was nominated for the Mercury Prize. In 2007, her second album, Kala, was voted Mixmag's Album of the Month in the magazine's September issue. Mathangi "Maya" Arulpragasam, the daughter of a Tamil activist-turned militant, Arul Pragasam, was born in Hounslow, London. When she was six months old, her family moved back to their native Sri Lanka. Motivated by his wish to support the LTTE, her father became politically known as Arular and was a founding member of The Eelam Revolutionary Organisation of Students (EROS), a militant Tamil group. Her alias, M.I.A., stands for both Missing in Acton and Missing in Action. While residing in Sri Lanka, Maya lived with her grandparents. After a year, as her father's involvement in militant activities increased, Maya, her older sister Kali, and their mother moved to Jaffna in the far north of the island, where Maya's younger brother Sugu was born. Contact with her father was strictly limited, as she says he was in hiding from the Sri Lankan Army. Eventually, as the civil war escalated, it became unsafe for the family to stay in Sri Lanka, so they were forced to relocate to Madras, India. They moved into an almost derelict house, surviving there for a while with sporadic visits from Maya's father. However, financial struggles, illness as well as limitations of food and water meant moving back to Sri Lanka, with the help of an uncle, where they settled in Jaffna again. By now, the ethnic conflict in Sri Lanka was at its peak, and the family once again tried to flee the country. After several failed attempts to leave, Maya’s mother successfully made it out with the three children, arriving first in India before finally returning to Maya's birthplace in London, where they were housed as refugees. It was in the late '80s, on a council estate in Mitcham (South London), that an eleven-year-old Arulpragasam began to learn the English language. Here she was exposed to Western radio for the first time, hearing broadcasts emanating from her neighbours' flats. Her affinity for hip-hop and rap began from there. Acts including Public Enemy, Big Daddy Kane, Roxanne Shante and N.W.A. would become just some of her influences. Arulpragasam attended London's Central Saint Martins College of Art and Design, where she studied fine art, film and video.